Man, my neck is stiff and my shoulders ache, it’s time to get up out of my chair. I can twist and stretch my shoulders and back and it does feel good. Sitting in a wheelchair, or an office chair for too long is hard on the back, neck, tailbone. Slouching is a real problem and can affect your neck, shoulders and back. Especially if your like almost everyone around you no matter where you go, bending and slouching over their phones , neck bent while texting. This puts stress and strain on the neck. Nothing can ruin you day faster than a pain in the neck. What to do to stop the slouch. Use one of Alex’s many lumbar cushions. 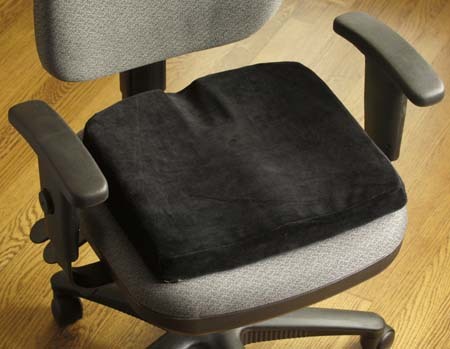 Using a lumbar cushion in your chair, forces you to sit properly, it supports the lower and upper back and makes it next to impossible to slouch, which in turn supports your neck, if you are like me you have to work at not straining your neck forward, but it will be worth the effort. Just need a little support, use one of our lumbar rolls, placed right at the lower back, you won’t slouch. 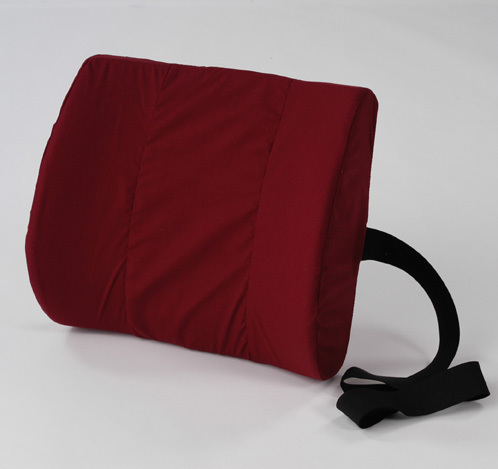 If your upper and mid back is well supported, but your seat and lower back are the problem areas and need help, Alex has many specialized seating cushions. We have foam and convoluted foam, memory foam and even molded cushions for a little support. We have specialty cushions for long term seating, gel cushions with skin protective and moisture resistant fabric, we have cushions with soft plush synthetic lamb’s wool. For a surprising cool and comfortable sitting time. Proper sitting can improve your performance, sitting improperly can cause back, neck, wrist, hand and shoulder issues, so if you improve the way you sit, it can help relieve those aches. Learning that you think you’re doing it right, and finding out you fall just short of perfection, because you have neck, back issues is hard to take. For example, my desk is ergonomically correct. I have my chair, so my arms are at 90 degrees to my desk, and my computer is arm’s length away and straight ahead, so I don’t have to strain my neck looking up or down. But I discovered while working on this piece, that I lean over my desk, strain my neck forward, scrunch my shoulders and go home with a sore, achy tired neck, almost daily. So how do I improve it. Well first of all, I adjusted by seat back, so I now sit with my tailbone to the back of the sit , I use a lumbar cushion, I’m using Alex 5321, I like the way it curves around my back as it supports the lumbar, and supports me sitting at the back of the chair instead of sitting on the edge of my chair. I also make sure my feet are supported by positioning them on a foot rest, I am short, and my feet never touch the ground if I sit back in my chair. I like a little contour to my seat, so I choose the 5570-seat cushion. Besides, the proper set up and good supportive cushions, you can do these simple stretches in your chair for some short-term relief. Grab the left arm of your chair with you right hand, twist, looking over you left shoulder, making sure your sit bones are on the seat facing front, repeat on other side, reaching your arm behind the chair gives added stretch. One of my favorites, sitting tall bring you chin back towards your neck, make sure your office door is closed, not my best look, but it feels good stretching the back of my neck. Thanks for reading , see you next time.